Clean Air’s Edwardian Fireplace Inserts are perfectly suited to an existing, unused open fireplace and must be installed directly into a full brick masonry chimney. The Clean Air Edwardian Fireplace Insert, with a sleeker and slimmer fascia design than standard, adds timeless elegance to any house. It boasts all the features and appeal of the entire Clean Air Premium range, with a large heating capacity of 18-30 squares of open plan living. Combined with surprisingly low maintenance requirements, the Clean Air Edwardian Fireplace Insert cannot be bettered for presentation, heating performance and efficiency. 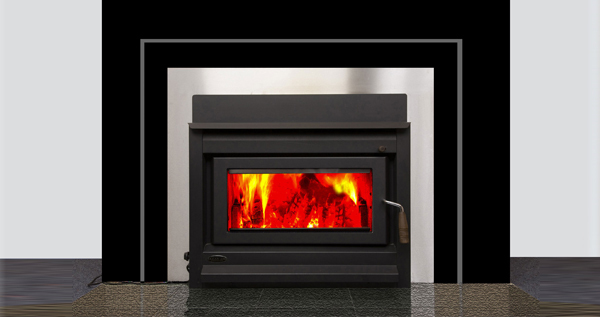 It performs with maximum heating output, adds functionality to an overlooked space, reduces heating costs and enhances the value and appeal of any room. The Edwardian Fireplace Insert brings a touch of class and sophistication to your living area. With the acclaimed Firebox design of Clean Air Premium wood heaters, the Edwardian Insert has exceptional clean burn technology, a long overnight burn capacity and low emissions, and is the perfect addition to any home. Available in a choice of eight fashionable colours and with an optional gold or chrome door.